To promote awareness and trial of the rollout of its delivery service — now available in 897 U.S. cities in 43 states — Panera Bread is offering free soup with eligible, digitally placed delivery orders on May 9. The fast-casual chain is promoting the soup offer through media outreach, social and digital. Panera is also promoting the overall expanded delivery option (no mention of the free soup offer) through a 30-second ad airing on addressable television (below), and two 15-second ads airing on linear TV (one focused on salads; the other on sandwiches). 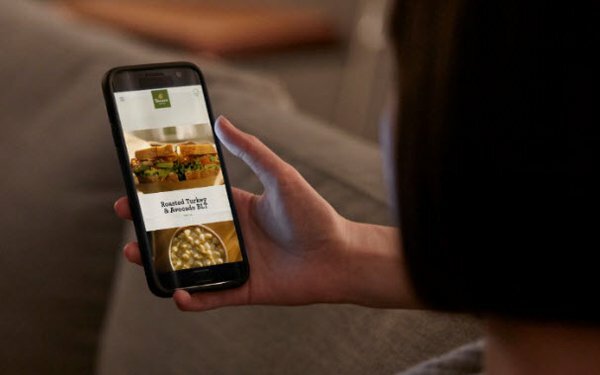 Digital delivery through Panera’s website, app and kiosks — particularly tied into the MyPanera rewards program — is “fueling our next phase of growth,” summed up Panera CEO Blaine Hurst. Digitally generated orders already account for 30% of Panera’s total sales. Rewards program members can save their favorite orders, and earn and track rewards. To qualify for the free soup offer, good on May 9 only, consumers need to enter the code “PANERADELIVERS” and place a cup of soup in their virtual carts, as well as include at least one other item costing a minimum of $5 before tax. There’s also a delivery fee: $3, in most markets. Within the urban markets now activated, delivery — to either home or office — can be ordered from most areas within an eight-minute drive time of a participating Panera café. Most of the cafés will make delivery available for lunch and dinner, from 11 a.m. to 8 p.m.
Panera says that it aims to employ its own delivery drivers in every market in order to facilitate its ability to expand the service. It had hired more than 10,000 drivers and associates system-wide by the end of 2017.